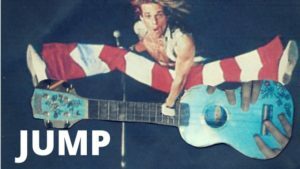 I have this inexplicable obsession with David Lee Roth. I think it’s those kicks of his. No, not his shoes. His literal kicks. I can’t think of a better way to express joy than with a heartfelt, nose-high DLR kick. That’s how I’d like to approach 2017 – joyful, over-the-top, and celebrating every tiny success. My word for the year is “Determination.” 2017 is going to be a LOT of work – professionally, personally, politically – and I am ALL IN. But when one has such daunting tasks ahead of them, it’s all the more important to celebrate the wins. …or put on a strange-smelling Taco Pizza Cat onesie and perform a Van Halen cover on your ukulele. To-may-toe. To-mah-toe. Tell me your word. Tell me your wins. Tell me you brought some tequila because I have a new mixer I’m itching to try. And let’s toast to the New Year. My word is clarity. Seeking some. Any. Even a smoodge. My daughter, my most favoritist human, got a uke for her 18th. She loves musical theater with a firece passion (thank you Universe) and is a social justice warrior (thank you again Universe). Who loves onesies. Somehow I think y’all might connect. Peace and Love, Your always fan in NC. You know I’m from North Carolina, right? And now I’m craving hush puppies like whoa. I do know you are from NC. And I speak for the state when I say we miss you. I’d buy you a big ole plate of hush puppies and we could talk all things musical theater and kids and living an authentic life. I have a feeling you’d be a great role model on that last one.